Stamford is a city in the northeastern state of Connecticut. Many live near what have been called ‘wealth-building engines,’ says David Thompson, a wealth expert with Phoenix Marketing International. This part of Southeastern Connecticut is close to New York City. It is also home to a number of financial businesses and investment companies. Other businesses like Priceline’s owner and Xerox have offices there. The study found that the Bridgeport-Stamford-Norwalk area has more millionaires than California’s Silicon Valley. Silicon Valley is all technology, but this part of Connecticut “is finance. It’s consulting,” David Thompson said. 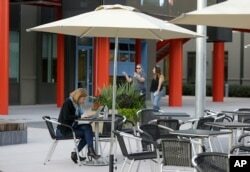 In this photo taken Feb. 3, 2015, a woman works on her laptop as two other women walk through the campus at Facebook headquarters in Menlo Park, Calif. The San Francisco area finished fifth on the U.S. millionaires’ list. The California city's cost of living is 93 percent higher than the national average. Just over eight percent of San Francisco's 1,781,731 families have $1 million in savings. VOA’s Dora Mekouara reported this story. Susan Shand adapted her report for Learning English. The editor was George Grow.